For other uses, see Lapidary (disambiguation). A lapidary (lapidarist, Latin: lapidarius) is an artist or artisan who forms stone, minerals, or gemstones into decorative items such as cabochons, engraved gems, including cameos, and faceted designs. The primary techniques employed are cutting, grinding, and polishing. Carving is an important, but specialised technique. Hardstone carving is the term used in art history for objects produced by the specialised carving techniques, and the techniques themselves. Diamond cutters are generally not referred to as lapidaries, due to the specialized techniques which are required to work diamond. In modern contexts "gemcutter" typically refers to people who specialize in cutting diamonds, but in older historical contexts it refers to artists producing engraved gems such as jade carvings and the like. By extension the term "lapidary" has sometimes been applied to collectors of and dealer in gems, or to anyone who is knowledgeable in precious stones. The earliest known lapidary work likely occurred during the Stone Age. As people created tools from stone, they inevitably realized that some geological materials were harder than others. The next earliest documented examples of what one may consider to be "lapidary arts" came in the form of drilling stone and rock. The earliest known examples of drilling date back approximately one million years ago. The early Egyptians subsequently developed techniques for cutting and polishing stones as hard as quartz, such as amethyst. Apart from figurative carving, there are three broad categories of lapidary arts. These are the procedures of tumbling, cabochon cutting, and faceting. Most modern lapidary work is done using motorized equipment. Polishing is done with resin or metal bonded emery, silicon carbide (carborundum), aluminium oxide (corundum) or diamond dust in successively decreasing particle sizes until a polish is achieved. In older systems the grinding and polishing powders were applied separately to the grinding or buffing wheel. Often, the final polish will use a different medium, such as tin oxide or cerium(IV) oxide. 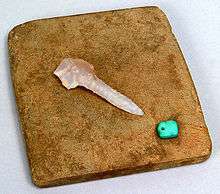 Cutting of harder stones is done with a diamond tipped saw. For softer materials silicon carbide, garnet (emery) or corundum can be used in place of the diamond. Diamond cutting, because of the extreme hardness of diamonds, requires the use of diamond tools. The cutting, grinding and polishing operations are usually lubricated with water, oil, or other liquids. 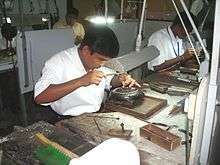 There are other forms of lapidary work, beyond cutting and polishing stones and gemstones. These include: casting, faceting, carving, jewelry, mosaics (e.g. little slices of opal on potch, obsidian or another black stone and with a clear dome (glass or crystal quartz) on top. There are lapidary clubs throughout the world. In Australia there are numerous gemshows including an annual gemshow, the Gemborree which is a nationwide lapidary competition. There is a collection of gem and mineral shows held in Tucson, Arizona, at the beginning of February each year. This group of shows constitutes the largest gem and mineral event in the world. The event was originally started with the Tucson Gem and Mineral Society Show and has now grown to include dozens of other independent shows. A specialized form of lapidary work is the inlaying of marble and gemstones into a marble matrix, known in English as "pietra dura" for the hardstones like onyx, jasper and carnelian that are used, but called in Florence and Naples, where the technique was developed in the 16th century, opere di commessi. The Medici Chapel at San Lorenzo in Florence is completely veneered with inlaid hard stones. The specialty of "micromosaics", developed from the late 18th century in Naples and Rome, in which minute slivers of glass are assembled to create still life, cityscape views and the like, is sometimes covered under the umbrella term of lapidary work. In China, lapidary work specializing in jade carving has been continuous since at least the Shang dynasty. Wikimedia Commons has media related to Lapidary. ↑ "Oxford Dictionaries: Definition of lapidary in English". Oxford University Press. Archived from the original on 22 September 2012. 1 2 3 Ripley, George; Dana, Charles A., eds. (1860). "Lapidary". The New American Cyclopædia. Volume X, Jerusalem–MacFerrin. New York: Appleton. pp. 310–311. 1 2 Kraus, Pansy D. (1987). "Preface". Introduction To Lapidary. Iola, Wisconsin: Krause Publications. p. ix. ISBN 978-0-8019-7266-9. ↑ "lapidary". Webster's New World College Dictionary, 4th Ed. Archived from the original on 3 May 2007. ↑ Cocca, Enzo; Mutri, Guiseppina (2013). "The lithic assemblages: production, use and discard". In Garcea, Elena A. A. Gobero: The No-Return Frontier Archaeology and Landscape at the Saharo-Sahelian Borderland. Journal of African Archaeology Monograph Series 9. Frankfurt am Main, Germany: Africa Magna Verlag. pp. 129–166. ISBN 978-3-937248-34-9. ↑ Kraus, Pansy D. (1987). "History of Lapidary". Introduction To Lapidary. Iola, Wisconsin: Krause Publications. pp. 1–6. ISBN 978-0-8019-7266-9.